Zoho CRM empowers small to large-sized organizations with a complete customer relationship lifecycle management solution for managing organization-wide Sales, Marketing, Customer Support & Service and Inventory Management in a single business system. Zoho CRM Reviews Recently Reviewed! Zoho CRM is the best CRM on the market for the needs of customizing a tool. From Zoho CRM you can integrate all the elements for interaction with customers or future customers. Zoho is the only tool from my experience that allows to create, through a simple algorithm and conditions, the workflow of an area. Start with a client, potential clients and opportunities. From there the flow continues according to what the company has defined. From this tool you can cover the initiatives oriented to prospects and clients: marketing, activation project, indicators, social network management, customer service, emailing marketing, inventory, human resources management, among other features. It really allows to integrate the modules according to the company's need. Even. Cons: Points that could be improved from this excellent CRM tool, is to include tutorial guides, as well as include a base configuration of a CRM, that is, show an initial configuration of the use of the tool. Taking into account, simple modules to implement the tool in any organization: social networks management or emaling, capture the prospect, add opportunities, billing management, customer registration. Overall: Zoho has allowed us to optimize our pre-sales and sales efforts. Taking into account, the versatility of the tool to close opportunities. Additionally, we have incorporated the service delivery process using the project module for this procedure. Pros: Good Zoho CRM, is a very useful tool to manage the relationship with customers, helps us to inspect the commercial work with customers, provides us the option of making reports which allows us to streamline the process of buying and selling with our suppliers, On the other hand, another fundamental and important aspect of Zoho CRM is that it is economical and thanks to its easy handling of the platform it helps us to increase our turnover and revenues to the company. In general, it is a very robust software when it comes to monitoring purchases and sales and something very significant is that it allows us to interact and link with social networks such as Twitter and Facebook. This is important since nowadays all companies have these platforms. social networks, additional account also with a mobile application that allows us to be connected to our operations outside the office. Cons: What can be said about this application is that it should improve a bit in data security, since I work in the banking sector and because confidential data can be vulnerable because it is a software that is in the cloud. Also to be in line with the application, if you do not have an Internet connection you can not enter, but the minor details are this kind of problems. I would like to find a solution with which you can work online, but somehow maintain the data locally. Overall: t is a very useful software for the operations of purchase and sales of the company, all operations can be managed quickly and this allows us to obtain income faster than the result of these operations, the accounts of our suppliers are constantly monitored by their action in real time with only an Internet connection and over time, all operations performed, as well as doing business. in general it is a very useful tool. 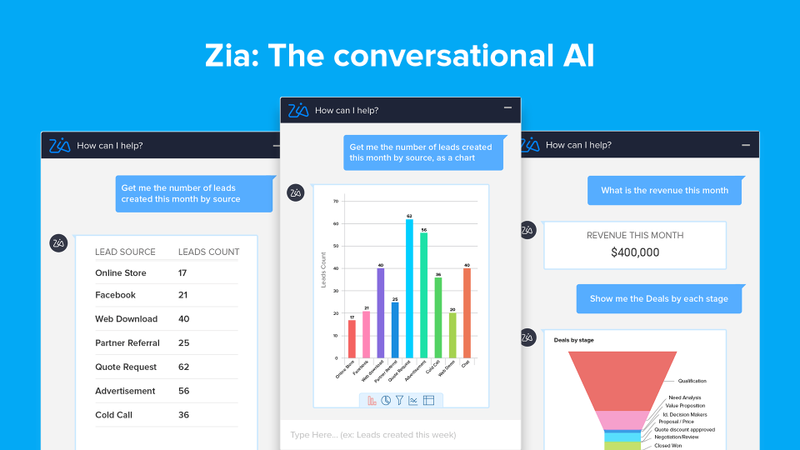 Pros: Beyond the basics of contact management, workflows and custom fields, Zoho CRM makes it especially easy to find the last communication and pick up right where you left off with any lead, deal, or client. It syncs with other Zoho products, as well as many external systems, making it perfect for a connected workflow. It also has an available API for creating custom application integrations. 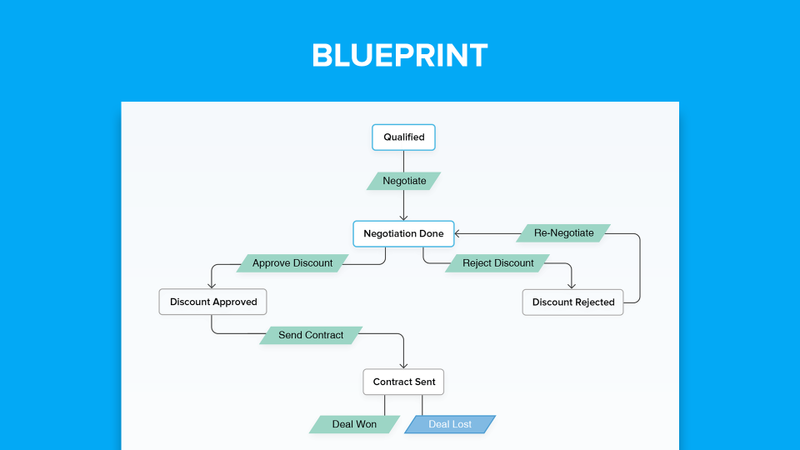 Creating custom workflows and approvals with Blueprint is a straightforward process, and the power that it provides for process management and automation cannot be underestimated. Self service portals for clients are another great addition to the power of the CRM. There are multiple billing levels available, so the system will scale with your business, or even better check out Zoho One for a simple and affordable solution to even more of Zoho services. One final Pro is that Zoho is consistently looking to make their product better, and has shown an extraordinary commitment to improving it's design and functionality. If you don't like something now, submit feedback and wait a little while, and it might appear. Cons: Integrating the CRM with other Zoho products can be complicated, and the integration experience is not completely consistent yet. It is clear that this is something that is being improved, but some of the products are not at the same level of polish as Zoho CRM. 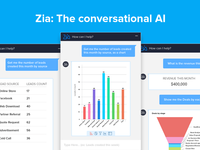 Zoho's introduction of an AI assistant is certainly cool to see, but it isn't quite ready for prime-time and much of what it can do doesn't seem to add a lot of value versus not having an AI. However, this will certainly continue to improve with feedback and it is good to see AI as a focus of future innovation in the product. Overall: Zoho CRM is simple enough to immediately begin improving a company's sales process out of the box, but powerful enough to create complex workflows, automation, custom solutions, and integrations. We were able to immediately start saving time working through leads, while continuing to improve and hone our sales experience, and then our customer experience by integrating with our Accounting system and Ticketing system. The Zoho CRM platform is very intuitive and easy to use immediately. Plus, for the money, it's the best in my opinion. Now, dedicate a few days to learn the CRM, combined with their other products... You seriously have the best solution out there I've ever seen and I've tried them all. Additionally, Zoho is priced far below the competition for what you get. Third party integrations for big names like Google and Facebook are amazingly simple to add and configure. Spend a few days on the trial period, dedicated a couple hours a day to learning their CRM, combined with the other solutions they provide that fit your needs... and you'll be spoiled compared to any others. Customer support is rather good, although based in India. I never had a problem or experienced a debacle they were not happy to help me with. Also, the company Zoho.. Across the board is moving forward every week/month with new features and updates to not only the CRM here but, their entire plethora of SaS solutions. If you are familiar with CRM's... I won't bore you with what it does. You already know what a CRM should provide and Zoho CRM does by far and then some. The learning curve really is not that bad, even then, there really is no limit you can take this platform to if you dedicate the time to learn and set it up. In the beginning of my startup phase (Having one employee besides myself), I really found it hard justifying the cost "per user" to use any CRM software. However, my end goal for the company was automation of anything Consumer Relations, related so.. honestly, I chose to save a couple bucks and went the open source route. Well, yeah.. It worked that way but honestly, it was open source but, closed. Anything I wanted that was not built by the community was insanely time consuming to implement. BUT.. It cost nothing that way and I didn't pay a per user fee. However, time is money AND... my implementations would have to be rebuilt anytime I wanted to update the core functionality. Overall: Price, easy of use, endless expansion, integration capabilities with big name companies already built in... and mostly... Insight. I am by far one the most insightful IT companies around in my area because I use this software. It's probably what pushed us past the competition. Pros: Overall, Zoho's CRM is about as robust as I've seen. It has a crazy amount of connectivity with other Zoho apps and integrates really well with G-suite apps too. Of all the CRMs I've tested, and I've tested dozens for at least 4 business models, Zoho seems to be the most flexible and cross-vertical friendly. There's plenty of competition and many that are designed for specific types of businesses, but what I'm finding is that just about any type of business (i.e. project management, online or web-based business, consulting, marketing, photography, etc) it can be customised to fit very well. You do have to be ready to put the time to set up your business though and that's true for any CRM. Yes, maybe some are a bit easier and faster, but if you're like me and like to bolt on new services, you'll appreciate that Zoho is likely going to still work for you, meaning less time having to start all over again. Cons: So here are the things you have to remember when choosing Zoho. Go for Zoho One! It's worth it to get all the other apps for the difference in cost. Chances are, you'll spend a lot less by staying with Zoho and dumping all the other API'd apps that Zoho can already handle. Another thing that you have to be aware of is that their service and support can be excellent, but that depends on the rep you get at the other end of the line. My advice is to be very thorough in explaining your request and don't let them start solving issues until you know for sure they really understand what you want. Another issue is that they don't support on weekends. For many that may not be an issue, but when you live and work in a time zone or business area that needs that, time to solve issues and not get in the way of daily work, that may matter to you. But overall, I can say that from the time I started using Zoho's suite, their customer support has improved vastly! You will also find you have the need to figure out some workarounds on issues that are core to your business. Sometimes things can be customised, but not always. For example, it's a pain to have it set up for people or contacts who are associated with multiple businesses, something that's rather common in my space. Again, if you get the right technical help, you can solve issues like these. Their documentation and help videos are just OK at best. I find them very confusing and too technical at times, and I'm a pretty technical person, so once again, this means you'll be depending on their support team and you'll want to be ultra clear on what you want to accomplish. ZOHO CRM The right fit for a medium company. Comments: I am a sales consultant and was asked to recommend the best CRM for a group of 3 companies, with around 50 persons each. After an evaluation of 15 initial products, Zoho CRM resulted the most adequate for this companies. The product itself is very easy to use, friendly user and extremely easy to adapt. In terms of price/performance, in my opinion is one of the best against other brands when you have a limited budget. It is basically design for pipeline management, activities tracking as well as customer´s, also, it has a great mobile client, that said by one of my customers employee, it is even easier to use it than work on the PC. I have been able to use other CRM´s like Sales Force, SAP, Siebel as a user in big corporations, and those are great products, but I think that for small and medium size companies, this product is simpler, less expensive and easy to use. Pros: - Easy to customize: The product is extremely easy to customize, at the point that unless you are going to do something very specialized, you might need external support, otherwise, the ramp up curve is easy and fast. There are different versions to subscribe, the higher the version, the more you can customize. They also let you try the product for a 30 day period and you are able to switch between different versions to compare them. The bottom line is that you will not need to spend extra money. - Language: My customers needed the product in spanish, Zoho allows you to switch between one language and another seamlessly. - Price: There are different versions, that are very affordable, one of the difference against the leaders is that the price up to 5 users might be the reasonable, but above 5 the prices goes really high. In the case of Zoho below 5 is free with its limitations, and then you have a reasonable step up depending on the versions. - Mobile Client: Simply amazing, once you have the product running, literally, every task or query you can do in your desk, you can also do it in your smartphone. The interface is clean, nice, intuitive and easy to use. - Tracking and follow up: One the strongest features I found is the tools to remind you of the follow up of tasks, meeting, calls, etc. You can get advise by email, phone, etc. - Sales methodology and Pipeline review: If your company has a black & white sales methodology, it is very easy to set it up in the CRM, also the way to view the pipeline is very intuitive and visual. It makes very easy to do pipe review and lets you drill into any module with just a click. 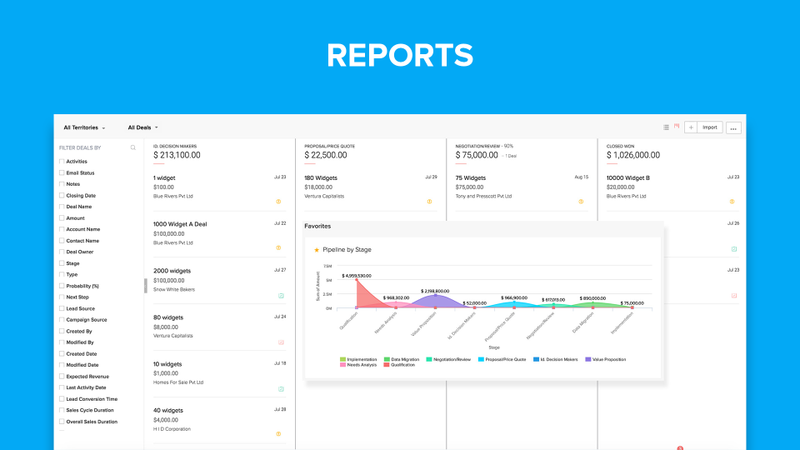 - Views: You can have the report & the view you need, the product comes with a lost of sample reports but also lets you do your own (The higher the version, the more you can customize) - Workflow for triggering events: This is a great feature where you visually can determine which tasks are needed to execute after one event happens. Amazing feature. Cons: There are many "add ons" that can be very useful once you have your CRM, by example ZOHO Projects, . My only advise is that from the beginning you have a clear understanding of what your company will be needing as this modules are priced separate from the monthly fee. Depending on the modules, you might end spending more dollars per user on them than on the crm fee. Recommendations to other buyers: If you are a mid size company that needs to have a pipeline tracking, customer centralized data, strong follow up for the sales people and mobility at a good price, with a solution that can be easily customized without having to hire consultants for months, this is the CRM I recommend. Cons: White the new version has some great new features (seeing when a client opens an email), it is also harder to find the customization modules and I hate that Events I create automatically are marked as closed when the date arrives. Sometimes events do not actually occur, or I have to get to them the next day - I use events to do important tasks. I want to be able to mark it closed. I want to be able to mark any activity closed in a very fast, easy way... just a check, done. Also, wish the activities would show in the calendar, not just events. Wish I could see what my team member sees on her calendar, especially when we share an event. The creating a call function is too cumbersome and too many steps, you have to scroll down, etc. Make it faster, easier... takes too long. Wish there was a faster way to even log a quick call... reminders need to have more options like 1 week out or 2 weeks out, even 1 month out. Really do not like that I cannot see my screen (lists) of prospects or clients at a glance as it only shows a few at a time, you have to go to next page - font is too big, too. Dashboard is not very customizable and doesn't give me the ability to put in the reports I created and want to see... getting help is ridiculous. I have to "chat" - send a message basically, then I have to wait for a response. Need to be able to get answers and help faster. Overall: I run a small business and I evaluated many, if not all of the CRM's available to small companies. By far, Zoho offered the greatest functionality, ease of customization and overall value in price. Zoho offers the ability to create mail merge templates - one of my criteria when choosing a CRM - few others if any offer this. Also, I love that I can see when a client or prospect has opened or read an email, right from the application. Reporting features are fantastic too! I was even able to add a Zoho code to my website so now all new leads come directly into Zoho and receive an email immediately from me. Overall, I can now contact my prospects faster and close sales faster. I can manage my clients better with great detail right on their records and my one team member and I can better communicate through the CRM and even assign each other tasks. Although I highly recommend it, I do wish Zoho had live Chat Help. Takes a bit to get a response when you need help. That said, overall, best CRM, best value for small businesses that want to see and understand where their business is related to sales, sales pipeline and customer management. Recommendations to other buyers: I think I said it above... really need these things addressed and you will be almost perfect! Thanks. Pros: Zoho CRM is basically a one stop shop for your business needs. I use it in my office everyday, and we can customize different modules based on the growing needs and demands of our company. Additional pros: Super simple to use. You can create buttons that do all the work for you (example: sending auto-emails). The tech support is usually a long wait, but once you have them on the phone or chat box they are super knowledgable and ready to assist with anything you need. Love love love this software. Cons: Because it is so customizable, there are basically no limits to what is buildable with it. Need a specific accounting software? Zoho CRM. Need a time clock for payroll? Zoho CRM. Need a calendar view for medical records? You got it...Zoho CRM. The actual building of modules is really dense, so having a team member with developer skills is almost a must-have if you choose to dyi your software. Like I said in the pros section, the tech support at Zoho is wonderful and super helpful, but the wait time is a bit lengthy. Overall: As my company continues to grow, we are able to meet and exceed all our demands by using this product. We have cut costs by eliminating manual work (such as sending repetitive emails and reminders to customers) by utilizing the auto-email function and setting up templates for emails that need to be sent out on a regular basis. That has allowed our employees to focus on more important tasks and be able to really get detail oriented. I would recommend Zoho CRM 10 out of 10 times to anyone looking for an alternative business management software. Cons: - They used to have a vision not anymore. Their technology is always a few years behind. - They were one of the first live chat apps, but no chat bot. Overall: Cheap and customizable. Easy to export and import. Fully featured when considering their Zoho One product with projects, invoices and more. Pros: Ease of use, connectivity to outside apps (Google Apps for business, Ring Central) and the search function. Cons: Sometimes I have a hard time explaining what I need to tech support. This is not a problem with other vendors so I know it's not in the way I'm explaining things but to their credit we always solve my problems just not always on the first try. Overall: Zoho was not the first CRM we tried but it's the best fit for our business. We've been using it for about 2 years to manage our pipeline, contact list (and related notes), track activities we wish to perform, activities we've completed, upload PDF copies of our handwritten scribbles, attach completed forms and documents that we'll need later. We have a section within each person where we keep links to our private YouTube channel with training tutorials. It is our hub for things that you might try to remember. Our actual work is performed outside of Zoho using industry specific software but Zoho is how we ensure that we don't drop the ball and that we quickly and easily remember where we left off when we spoke to someone 6+ months ago. It takes a little while to get used to using software instead of saying "ohh, I'll remember that" or paying for something when you could save it in a 3 ring binder on your desk but once you get into the flow you'll never consider going back. Zoho's search function means that I can find anything I need in a few clicks. I use Google Apps for my email and Zoho for my memory. Recommendations to other buyers: I use a premium version but the lower tiers are still really amazing and solved many of my problems until I realized I wanted more. 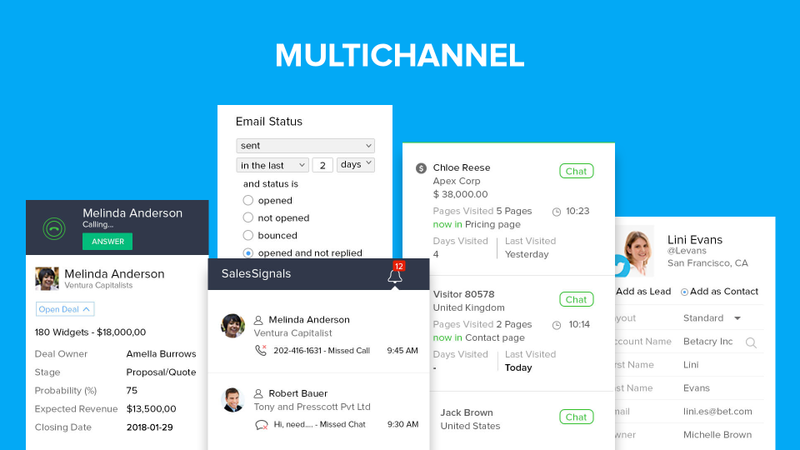 Pros: The suite of tools all designed for productivity and communication in mind. This has enabled me to deal with myriad software projects, I keep my clients in the loop, my devs and pertinent project management stays in order, financial records, payments and record keeping and above all else, time management and communication. Compartmentalisation ensures that my sales guys see what they need, development guys and clients all see what they need without intersecting unless required. I, as the administrator can oversee all and ensure everything is happening in a timely and smooth manner. I utilise their mobile apps as well so that I can stay in the loop while away from the computer, be it on the train or on holiday. Cons: The price point for me is well worth it because it is a fraction of the net worth of even one of the myriad projects that I am able to develop utilising this suite of software. However, I imagine that a smaller operation might well find the top tier pricing out of their league, there are alternatives, though none that I can imagine are as useful as Zoho, I've tried a few over the years and we didn't stick with any of those whereas we have gone with Zoho for the reasons mentioned above. That being said, there are free versions which would fit smaller outfits and cheaper options than the top tier. Overall: Very positive, never raised a ticket or questions the customer services, their support documentation and just uptime and user-friendlyness has been perfect for us over the last couple of years, I can't think of anythign negative to say. Pros: I like ease-of-use, price, and easy customization. Overall: I manage Zoho CRM (Enterprise subscription) for a small B2B company. We have used this platform for about a year and a half now. Price: Compared to other options, Zoho has great pricing for the features/value that you get. Features: Zoho has a large number of features available to Enterprise customers. We, of course, use the Leads, Contacts, Accounts modules to keep track of all customer information. Zoho has greatly impacted our ability to keep track of the potentials/opportunities in our pipeline and to stay on top of follow-ups with customers. Also, despite our complex quoting process, we are able to quickly generate professional quotes for customers. We use the Zoho CRM Documents module to work on documents simultaneously. This eliminates the need to save several versions of documents. 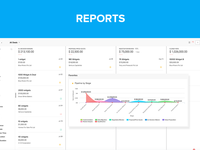 We use the Reports feature to evaluate performance, identify strengths/weakness, etc. The Campaigns, Solutions, Forecast and other available modules are also very useful. Ease of Use: I think using Zoho is more hands on, as far as doing most of the initial setup and customization yourself as opposed to Zoho doing it for you (like other CRMs offer), but the process is relatively easy. Because our company has many unique pieces of sales/customer information that it wants to capture, Zoho's easy customization has been a great fit for us. Customer Support: There are a variety of ways to contact Zoho. I use the live chat most of the time and am usually able to get assistance right away. Development: Zoho seems to actually take note of feature requests and feedback from customers. They release a very good update to the CRM this year that provided several new and improved features. I am looking forward to seeing how the platform continues to evolve. Comments: I think Zoho is a great option if you are looking for a free CRM in a smaller work/sales environment. It simplifies a lot of sales and marketing tasks that can be cumbersome. It is not very sophisticated with other integration (at least in the free edition). At my company, we need a cheap solution that would securely store leads and contacts so we could keep track of our interactions (e.g. emails and events), while still having the ability to standardize templates with our recruiting team. Pros: A Huge pro for Zoho is that it is free! It contains all the must-have features that most CRMs use l like uploading leads, contacts, creating and sending emails, templates, tasks, etc. The user interface is very simple and user-friendly. It is robust enough to allow you to customize your dashboard view so you can be even more efficient. Zoho does integrate with outlook and googles calendars, making it easy to schedule and send invites to clients/customers outside of your organization. The email templates are also a useful feature that is so easy to use. You can upload your own photos, logos and custom colors. Cons: What I don't like about the CRM is that email campaigns and invites from Zoho are more likely to be blocked by spam filters. After sending out email campaigns and invites, I have had to follow up with most of the individuals I reach out to, because it has been filtered to their junk email. I can't seem to find a consistent pattern either - as some people from the same organization received the email in their inbox, while others found it in their junk mail. Pros: I started using ZohoCRM to help make sure I didn't forget up coming events. I didn't have a lot of clients but I needed a way to document conversations and make sure each clients was given the same information. Fast forward my company has grown and ZohoCRM has stayed my go to for client management. When I first started I didn't uses any of the automation. Now, I couldn't survive without the automation! We are so busy and leads are coming in from so many different avenues that potential clients could slip through the cracks. But with this CRM no client gets missed. I never worry that I will forget any critical touch points with clients because the automation triggers ensure I don't and I receive emails in in the morning with every task I need to complete. The home screen gives me a clear picture of what leads we have, what tasks we need to tackle, and what events we have coming up. I have not seen another CRM that will give you more bang for your buck. Cons: It took me a while to understand how to customize the automation. I would recommend them creating video tutorials. Overall: Overall I have had a phenomenal experience and I usually recommend new business owners to use ZohoCRM for there customer relationship management. Pros: Reporting. Dashboards, Association factor of leads and contacts. Overall: Zoho CRM is a part of my daily life as a Software Sales-Consultant. Let me list out the pros and cons. 1. The first thing I admired about Zoho CRM is, its ease of use. I know many Saas CRMs are easy to use. But this one packaged with multiple options and features than some Saas CRMs yet I never find it hard to use all the features. 2. Reports: I always love to generate reports for my Vendors and my boss. Reporting features comes with numerous customizable filters . Dashboard with reporting is icing on the cake. 3. Very seldom I faced server issues as it's a cloud based service. 4. Sales pipeline became easy now as we can categorize all the leads with regards of product, Vendor and Etc. 5. Innovation: I like that they always come with innovative ideas integrated with such less complexity. 6. Value for the money: I believe that Zoho brings most features which can be seen in Salesforce, SugarCRM and etc, but in a reasonable price. Completely satisfied with that. 1. Customer Support: Well they have 24/7 customer support. But the knowledge of any Tech Support person is not sufficient to resolve any big issues. Yet they are quick and kind. 2. 2016 update: Well it comes with many goodies like Sales-Impulse and lot but have many bugs as well. Sometimes i could not add a note on a lead or contact. I spoke to them regarding this and hope that they will resolve it soon. 3. Lack of Customization: Sometimes I feel like it would be better if they let me add my own customization on data fields and Filters. The scope of customization is comparatively less. Recommendations to other buyers: Firstly I appreciate the idea of getting feedbacks from the users. You guys rock. Overall: It's a CRM, so the benefits are quite obvious I think. Zoho is a complete platform for presenting our products towards clients. Pros: Zoho CRM is a basic tool for representing our products in front of clients. It provides us best features for creating a good relation with customer. We can describes all features of product and get helpful remarks of customer for further improvements. User can track customer in various ways and have all access to customers profile. Easy way to stay in touch with customer and connect them at the time of need. It's a better option for us to upgrade our business to high level. Cons: Zoho CRM has basic features for marketing but also have some difficulties to work with this tool. A little bit complex for new user and have so many options are quite hard for work. Should be an option for connect with section and fields. Zoho CRM is much difficult for configure products in front of clients and So expensive for purchasing license. Need more updates for work better for marketing our products completely. Overall: It has basic features for product automation and enable us to upgrade our products as need of customer. So easy for user to describe product features and can easily creates reports. Relatively flexible for user to customize products and provide good service for clients. A little bit training required for work with this marketing tool. 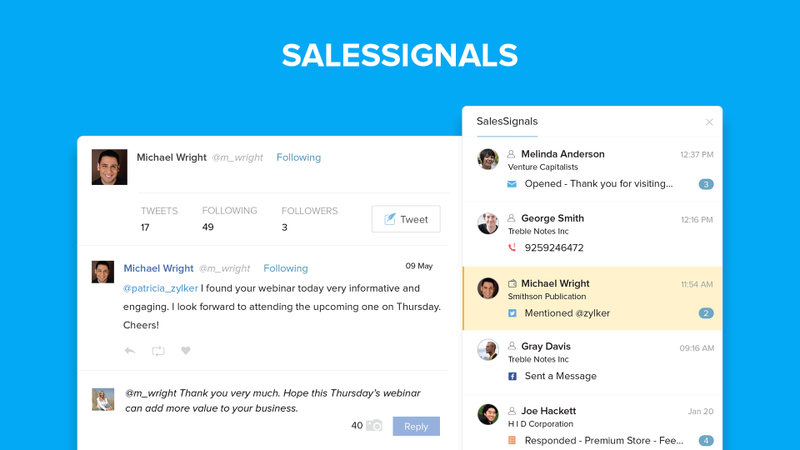 A great, but simple, CRM system. Great for trade shows! Pros: We use Zoho to track our sales leads, ongoing projects, and trade shows. In general I'd say the biggest pro is the flexibility and customization offered by the software. It's some serious bang for your buck! To this day, we create new tabs and have it track new lists or integrate it with new software. Cons: The mobile app. It's really lacking. It will not display leads or trade shows as they are sorted on my desktop, which ultimately makes it useless. Sorting alphabetically doesn't work for leads or trade shows when the database goes back 7 years. If a mobile app is vital, Zoho may not be the best solution for you until the app is upgraded. Overall: Overall it's a good value in an easy-to-use package. It's not going to be a powerhouse like Sales Force, but you're going to be able to set it up by yourself relatively easily. As a trade show manager, it's one of the best solutions for tracking every single detail of a trade show. I can track the equipment I need, my move-in times, key costs, badges, ordering guides, and so much more. Then, I can upload my leads to the Sales side of our system and correlate each lead with the originating show. All of this was customizable when we launched Zoho. We continue to tailor it to this day, now interfacing the database with a few cloud-based services to handle lead outreach. If you're looking for your first CRM system offering value and scalability before the leap to something major like Salesforce, this is your winner. Comments: We are using Zoho email, calendar and CRM to run our small startup with 5 active users. I've previously used the full Salesforce.com package in a large multinational. I have to say the Zoho allows me to do the same things that I previously did in Salesforce to a pretty high level. Having said that, I don't think that Zoho is that cheap either, at USD $20 per head per month. That's $1200 per year for 5 people. A necessary evil unfortunately. Part of signing up for Zoho CRM is that they offer a call with one of their support staff to familiarize you with the product. This was a complete waste of time. Fist the call was 20 minutes after the appointed time. The man from India who called me was completely distracted and appeared to be taking other calls (putting his mic on mute) and typing on a keyboard while I was trying to ask him questions. He was very arrogant and rude and a liar. When I pointed out that he was typing instead of listening he denied it. I'd asked him the same question 3 times, and each time he came back with the same nonsensical question to my question. Bad, Bad, Bad. I ended up hanging up and am angry that they wasted my time with such a pointless and empty offer. 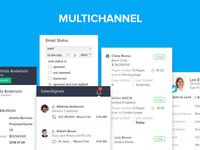 Pros: It's a fully functional CRM package for a small enterprise. It is relatively intuitive to use and I like that automatically picks up the emails you send and appends them to the client record, provided you've entered the clients email details. Cons: The Indian call centre is a disgrace. Worst I've come across and that's saying something. I don't think that the CRM calendar sync's with the email calendar. Recommendations to other buyers: Avoid the call centre at all costs. If you can't work it out yourself, don't bother calling them as you'll just end up angry. Hi, I am Jayashree, Quality Manager at Zoho. Firstly, we apologize for the lack for quality support. We assure you that we will look into this and have it corrected as soon as possible. In the meantime, please do send us an email at support@zohocrm.com with your questions and we'll be happy to assist you with them. You can mark the email to me and I will take ownership to have things resolved for you. The Zoho CRM platform is the base foundation you need to get started. Pros: I love that Zoho has many different "bolt on" features that I can add depending on the needs of my business. The ability to integrate and scale is one of the many things I really like about Zoho. It's basically an Ala Carte menu that I can take advantage of when necessary. Zoho CRM and other Zoho products integrate seamlessly and you don't need a programming degree to figure it out. Having a better then average understanding of how technologies work is very helpful, but the novice shouldn't have any problems getting acclimated to how Zoho CRM works. Cons: Like most software services like Zoho their customer service isn't ideal and it often takes some time for someone to get back to you if at all. This is one of the biggest CON's I've noticed. You pay much less for their services, but you lose the customer service touches you would typically get with a service like salesforce.com. If you can handle the trade off, some people can't, then Zoho is for you. If you are aren't willing to sacrifice the ability to get CS in real time then Zoho isn't for you. Overall: If you are an out of the box thinker and someone who works well independently and likes to learn new things and build businesses, then Zoho is the platform for you. Most software platforms are migrating to this model and it includes numerous software bolt on solutions to help your business grow. If you are looking at building your business strategically and don't want to break the bank then you would be doing yourself a dis-service if you don't review and consider Zoho as proven growing software platform. Pros: zoho's crm has buckets and buckets of available information. it intergates well with outlook calendar and contacts. it is a very useful time management tool. Overall: My Golf course sales and management company purchases Zoho Crm as our first and only primary crm for every sales person and manager in the company. The biggest issues is they never delivered on their promises. We had several internet based customer data collection points outside of our crm. We were promised Zoho would inergrate with apps to pull of the prospects contact info. It did not. The entire company had to manually enter all prospect info every time we received an outside digital lead. Not only did we become more of a data entry team than a sales force, people hating using it and it became what you would expect. Garbage in Garbage out. Pros: I like the ease of use of the Zoho platform. We were able to get everything setup and working in about a day. We have this connected to our eCommerce platform and are able to easy import our records to keep the system up to date. It allows our CSR team to know just what a customer has done with us in the past and keep the conversation in context each time they talk. We also utilize the chat from Zoho SalesIQ that is connected with the CRM to keep all communication channels in sync. Cons: I do not care for the API limits that are enforced on the platform. Users get roughly 3000 api calls a day. This can make initial data loading for an established business take a while to get all legacy data imported into the system. Once things are there it is not much of a problem, but any time you may decide to import a new large data set this can really hinder the process of getting everything over in a timely manner. Overall: Overall we have been pleased with the value provided from Zoho. Not just the CRM, but other products they offer as well. We have really tried to tie in with the full suite of products to enhance our productivity and growth. Pros: To be honest, I was looking for a free CRM to run my small digital marketing agency, so the price point is fantastic. That said, the features and what you can do with this at the free level is pretty remarkable. The methodology will be familiar to anyone familiar with CRMs. Cons: So it's unlikely that anyone is going to move from SalesForce to Zoho, unless it was a pure pricing play. It's a little "clunkier" than other well known CRM's, but it has gotten better. I've used Zoho for about 5 years, and this is pretty trivial, but it would sure be nice to be able to view more than 50 leads per page. Overall: My use with Zoho only scratches the surface, and I'm not taking advantage of many of the advanced features with Zoho. My primary use is as a lead/deal management tool, and for that it works really well. Input leads, create tasks/reminders, add opportunities, update the opportunities as they progress through the sales cycle. Standard stuff, but very pleased. One other use for me, is many of my smaller clients don't have a CRM, know how to implement one, and don't want to invest heavily in one. This is a fantastic solution in these instances, and I look like a hero when I give them a quick demo and help them get set up. Easy to use and setup CRM. Excellent automated workflows. Pros: I used ZohoCRM in two different jobs. My first job was in Sales and Account Management. I used ZohoCRM on a daily basis and I was not the one who set it up originally. The tool is really easy to use with very good flexibility in adding/removing/changing fields. You can also add workflow automation which is great when you get it right. On my second job I actually set it up from scratch and I was surprised at how easy it was to set it up and get it running. Since I was an experienced used before, it took me, literally, less than an hour to get it up and going. I was able to import hundreds of contacts and leads with just a few clicks. Cons: The interface could be cumbersome at times. The editing of individual fields should allow the user to click anywhere in the field to go into update mode. Instead you need to click on the actual pencil, which depending on your screen resolution can be small and not as easy to target and click on it. The automation workflow is great, but it's hard to get it right and there's no easy way to test it out to see if it's going to do what you'd expect. If you set it up wrong you may not realize until some time later. It'd be good to have a way to test the automation you're allowed to configure. Pros: Zoho is cheap. And that is what I like most about htis software. It's economical for any kind of business - yet not compromising a lot on important features. Customization is fairly simple and easy. That's a big plus when it comes to maintaining your funnel with the kind of business you've got. While it's buggy, I'm afraid to raise support issues with the kind of experience people have faced in their support forum. Overall: This CRM is easy to set up and it's quite useful when you're getting started with setting up your sales process. It will have all your leads data and will save you a lot of time if your entire team can collaborate on tasks. So for starters, without having to spend much, and compromising a tad bit on UI/UX - you're good with Zoho CRM. We love the robust features and ability to customize to our business cycle. Pros: We investigated so many CRM's and found many of the others to have good marketing but a lesser product at a higher cost. We started with the free version and gradually moved up to the Enterprise Subscription so we could fully customize not only basic CRM functions but a full transaction management system. We have several custom modules and custom buttons that the Zoho Engineers designed to our specifications at no extra charge! You can use it right out of the box and get great value but the customization was really the icing on the cake for us. Cons: I like that their is a whole suite of products that can integrate into the CRM but unfortunately the three we have tried/investigated Zoho Websites, Zoho Mail & Zoho Survey have not offered us the functionality we need so we have had to use alternative products. Older versions linked with LinkedIn so you could synchronize pictures of contacts but this no longer is possible - I think due to LinkedIn making an exclusive agreement with another CRM provider? Overall: What software are you talking about??? Capterra? Comments: If you're looking for a CRM that is customizable and can adjust to your business, Zoho CRM is the best bang for your dollar. However, recognize that Zoho's platform is to develop features, *not* to be a sales partner. They have partners around the world who can help you on an ad hoc or on-going basis, but the 24/5 support is really just there for trouble shoot issues with the program - not to help you develop your business. Pros: The customization means that Zoho can be adapted to a variety of fields. It's generally intuitive for sales people and their cross platform support is really picking up with the new User Interface. Cons: Documentation is nearly non-existent. Support is present effectively only to address bugs, not to problem solve. Recommendations to other buyers: I've looked at a lot of CRMs but I've been very happy with the value of Zoho and am not leaving any time soon. As much as I wish they'd invest a bit more in their customer support, I am so happy with the product, the people working on the product, and all of the innovations they continue to bring. Additionally, if you're looking for a platform to build a business, Zoho has one of the richest ecosystems out there and they're basically hidden from view because they don't spend any money on marketing. A far cry from their competition. Comments: ZOHO CRM in general is a good CRM for SMB's. It's always one of the options in the CRM selection process. Any CRM is only as good as the business process behind it. Pros: Pricing: ZOHO CRMs pricing is very affordable for SMB's. The pricing structure allows businesses to scale up without worrying about the monthly subscription. Functionalities: Overall, ZOHO CRM's functionality is good. It has most of the essential business functionalities. Customizing the CRM according to the business process is very easy. It does provide basic reports and analytics that gives very good business insights. Cons: Functionalities: Although ZOHO CRM provides good functionality, it still lacks some of it that will definitely be an added value to most of it's customers. An example would be a validation rule. A lot of the customers have already brought this topic over ZOHO forums, although ZOHO CRM reps respond with courtesy, this functionality is still in the RnD. A few other requested functionalities have been requested, but it may take ZOHO CRM years before implementing such. Pros: I used ZOHO CRM to manage the sales campaigns. To boost the sales we plan for diffrent activities such as inbound sales, outbound sales, direct leads, custom projects etc: And zoho made it easier for us to track the development and revenues of each campaign. For each of the customer/leads we can add comments/update the lead status etc. Hence it makes the sales process very easy. Similarly we used it for recruitments/hiring. When there are bulk of applicants it becomes very tough to handle them. Zoho Recruit allows us to create seperate folders such as Php candidate, Java candidate etc and respective candidate resume can be added there. Status of calls/interviews/hiring status can be updated for each of the candidate. At the end it makes the recruitment process very friendly. Cons: It lacks some features such as for example in my CRM I have 100 leads added - there should be functionality for bulk email or for callings. This will be added advantage for sales campaigns. Cons: Some translations in other languages than english could be improved, and if the price could be in Mexican pesos so that we wouldn't depend of the US$ rate it would be perfect! Overall: I use and implement Zoho CRM for 3 years. For me it's the best solution for all type of companies: from a one person company to a big corporation with multiple subsidiaries. It's very versatile, you can have a simple CRM that will allow you to register your sales informations in the free version, but with the same app you can create a complex CRM solution, including integration with Zoho or tertiaries applications, that will help you manage your sales process from the begining of a marketing campaign until the post-sales issues and gives you all the business intelligence you need for strategic business decisions. Moreover, in comparison with other CRM on the market, it offers the same or even more features, for half the price of other solutions, for example, with CRM Plus, you can have a complete solution consisting in nearly 10 apps, for only 60US$, unbeatable quality/price ratio! Recommendations to other buyers: You can sync it with other Zoho apps in order to create a complex CRM solution that will solve a lot of your Marketing/Sales/After-sales issues. Zoho is the best CRM for the money out there. Pros: Ease of use and flexibility, customer service is amazing. Cons: SOME limitations on how dashboard items can be displayed. Overall: In our search for a CRM platform, i reviewed 5 separate companies, all of which are well known. all have their shortcomings, but Zoho had the fewest among them, coupled with absolutely fantastic customer service and a platform that is incredibly simple to use and teach others. the new update that zoho implemented in 2016 was welcome, and provides a UI that is sleek, and easily manipulated to suit whatever form of data i wish to see. BIG bonus points for the ability to seamlessly integrate gmail with the platform, letting me see my entire email history with any of the leads or contacts in the platform, at the record level. Development flexibility is great, reporting is easy to use and detailed. my only ding would be with button functions, and that the interfaces are not COMPLETELY customizable. Hey. nothing is perfect, but for a CRM, Zoho is easily the closest thing to perfect software as I have found. They saw the challenges and weak points in the various platforms out there, adressed them, and present it in the most streamlined way of the bunch. We custonized the modules and workfliw to suit our unique industry, no problem. 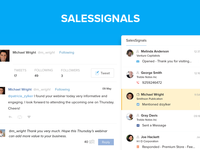 Highly recommend this software to anyone looking for a CRM. Recommendations to other buyers: Try it out, call customer support, and explore what you can do. it really will open doors and streamline your business. Pros: I have used Zoho CRM in two different companies and its performance was recommendable. It is easy to install and to use. All of our accountants must go through a three hours training for them to get the skills on how to use this product. It helps us in stock taking and understanding the best selling products in specific regions. I like the fact that you can be able to customize the Zoho CRM to meets your needs easily. It integrates well with other software helping us to merge emails, templates and reply to our client's queries easily. Cons: For the one year I have used Zoho CRM, I have nothing to complain about it's performance. You only need a stable network connection and you are ready to go. Overall: The software is awesome. It has brought a great impact since we started using it in our company. We fully rely on it in all our sales and purchases operations since it was implemented in our business. Few months ago, we started email marketing using this product and for sure we have are receiving clients from different regions where we have never reached before. Zoho CRM is a useful tool tool where every business person should implement it to their business for a real change. Pros: My company loves that we continue to find new and easy ways to manage multiple faucets of our business through Zoho CRM and the attached tools. We use it for everything from new prospecting to current client management and everything in-between. I would highly recommend Zoho CRM for any small-medium sized team that is growing rapidly and in-need of strong software that integrates well across the board. Cons: The thing that we like least about Zoho's Software is that it does take some time to learn the platform and different ways that it can help us and our business on a day-to-day basis. The one thing that Zoho needs more of is their webinars and teaching tools to take advantage of all of the great features that they have. Overall: We have had a great experience with Zoho CRM as our #1 tool to manage both our prospects and current clients. We wouldn't change software and we only hope to continue to learn how to use Zoho to enhance our daily operations. Cons: It's very difficult to setup to get it running at full functionality and the guides aren't in depth enough. Overall: We've been using Zoho CRM for almost 6 months now. The beginning was very, very rocky. It's tedious to get setup if you have no CRM experience, and while there are How-To guides out there, they aren't very in depth and didn't answer most of the questions we have. The guides cover the most obvious things you can probably figure out how to to do yourself (like adding company details). The more complicated things like setting up work flow processes, are not user friendly and don't have good enough manuals. Once you get setup and running though it's a decent CRM system, and very good for the price. I love their Sales Inbox feature and the way it separates out our salesmen's emails. We also use the Zoho CRM app on our phones and haven't been too impressed. Would love to see that upgraded and improved to better interact with the cell phones and log calls and texts. If you have Zoho Mail or any other Zoho programs already, definitely look into using Zoho CRM for your CRM needs. It's more affordable than some of the others like Salesforce, and has some good features that get the job done. Recommendations to other buyers: If you have Zoho apps like Zoho Mail already, then this ties in beautifully and is a great addition. Cons: The live chat option is lagging and was not able to coordinate with the same. After my trial period is over, we tried reaching the customer service to re activate and the response was bit delayed. Pros: Easy to use, the App for Android works perfect. I am on a free plan right now but we will upgrade as soon as revenue starts to kick in. I like the search and report functions in particular. It is a perfect tool for start-up business. We are a Chinese related firm with operations in China, and there is also a version available in china through a partner company. Otherwise SFDC and other popular CRM tools are blocked in China as of now. Recommendations to other buyers: Check out the free version first, and upgrade when you see your business grow. If you work for a larger organization than ours, than check how well it works with groups, chat function etc. I am sure it does, but that would be my prio no. 1, when we grow our business to have everyone on the same page, but not everyone need to access all data. Pros: I have used this product in two different companies. From this two experiences, I can honestly vote for Zoho as one of the best CRM currently in the market. It is easy and simple to install in various gadgets. We have been using this product in our company to organize and have a good work flow in all our daily operations. It has been helping us to understand our customers in a better way and get back to their queries without delays. Our marketers relies on this software when they are doing a certain research in the field when we want to introduce a new product to specific customers. I like how the product integrates well with other software making our work simple when dealing with many different data in different software. Cons: The product is awesome. My only concern is the support team, they rarely reply to emails and when they do, they ask too many personal questions rather than getting straight to my question. Overall: It is a good software in helping the business person to manage his or her work professionally. It helps us in managing our marketing teams by controlling their operations while they are in field. We use the product in understanding our stock level and the marketing trends of various products in specific regions. ZOHO is truly a turn key CRM solution! Pros: We love that fact that the different modules can be customized to suit the different business units within our organization. The ability to create the modules and then design rule based views to manage workflow is very simple to do, not time consuming, and doesn't require advanced programming skills. Cons: We feel the support side could be better when having issues or simple questions about features, at times the team doesn't seem to understand the questions we are asking. There are many little quirks with the software that somewhat limit the search feature, specifically the phone number fields. Overall: We have been using ZOHO for the last 8 years at our company. The software is very flexible and allows us to customize modules for different business units at our organization. Would recommend to others. Recommendations to other buyers: Would like to see more robust field mapping, creating permissions based off values in other fields.. potentially auto filling fields based off selections in other fields within a module/lead. Pros: Easy setup and use of the system and the ability to customize with a few clicks even for new requirements, which I did not foresee, when I started using the system. Overall: I started testing the free version Zoho CRM even before I did setup a new business in holiday rental. With start of the business I switched to the premium version which provided to me all the additional features and possibilities to customize the system to my specific needs. In the meantime I could further enhance the solution for a Coworking space, which I started in March 2015. What I also use is the easy integration with Zoho Campaigns, which helps me to be in regular contact with my customers and prospects. A great feature is the integration with my social channels on Facebook, Twitter and Google+. This helps to find additional new contacts and to stay tuned with my followers. Whenever I faced a problem or question I received prompt support from Zoho's support team. Pros: For most efficient businesses, one needs to create a regular relationship with the customers. Zoho CRM looks into all possible aspects of customer service management and further gives insights into how to deal and interact with clients. It promotes the use of context-aware solutions for the customers and encourages in being prompt in answering FAQs and customer queries. It is one of the far-fetched applications that include the use of telephony with click dialing. Social media integration and real-time sales management are also provided. It further helps in analyzing a summary of sales in a simple graph. Cons: The customer care is very efficient. It only offers a 15-day free trial. This can be a very short time for analyzing the sales patterns and hence difficult to take a decision on whether to purchase the real plan or not. Zoho CRM[- One tool to manage complete business. Pros: Zoho CRM helped us a lot in keeping the track of our client interaction and lead generation. This tool also facilitated us in creating statistic report of sales. This CRM is interlinked with all social channels so it provides everything one roof. Zoho CRM's layout is simple and easy to understand. It saves a lot of time by providing all facilities at a single place. It also includes a feature which helps team mats to interact and collaborate with each other in a better way. Zoho CRM got a lot of features which helped us in boosting up our sales and leads. From client detail to team collaboration everything happened in the single tool. The user interface of this tool is so simple as anyone can easily handle it. with help of this tool, we can keep a track of every interaction happened with clients which further can be used for remarketing and improving the sales process. Cons: This tool has really facilitated us in generating more sales and have not found any issue with tool yet. Overall: Zoho CRM can really be helpful in generating more sales and leads in any business. Single tool for a complete customer or client management. Pros: I love the reports that it generates. We can separate the leads based on the warm leads, Cold Leads and Hot leads. It will provide you the complete analysis in the form of Pie-Chart. We can segregate the data based on the status-quo like first stage, pipeline and closure. Cons: The least thing that l like about this software is if i upload the data , it reflects in P2 stage also even though its not in P2. Being in sales its very tough for us to categorize it. Overall: Iam in sales and its very much need for us to reach the client and we are relying on the Zoho CRM and When i upload the data into Zoho CRM and it allows me to view, edit or even deletion. The best part is that we can mark in the calendar when we can follow-up the lead. Daily/weekly/monthly reports can be fetched and even we can see the sales analysis using the pie-charts and it helps to do the accurate presentations to our internal stakeholders. Pros: This product has been in use to all business owners whether they operate small or big businesses. It helps business owners in managing their sales and handling their widespread customers. It brings various business operations in one system helping the business managers to supervise the businesses effectively. This product is used in marketing strategies by sending emails and replying back to the customers within minutes. It is easy to install, implement and use it in different businesses. It helps the business owners to make informed decisions for their companies. Cons: The developers should create tutorial guides to help the beginners to understand how to use the product effectively in their businesses. Overall: It is a great tool in following up of the purchases and sales of a company. It helps in processing a well-organized sales reports helping the business owner to understand the performance of their businesses. It prevents the cases of theft and loss of products from a company as everything is in records. Comments: I would recommend this for a tech savvy startup who is on a budget, at a very reasonable for one user this is a great tool for the office if you don't need individualized task assignments, if you have a bunch of users I would explore salesforce as a solution instead as the price will be better in the long run. Pros: The largest benefit with zoho can is it's ability to be customized for each user and application usage (however see cons). 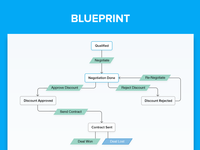 My favorite part of the tool is blueprint mapping, it will let you visually map out your work flows, tasks, emails, etc all in one screen, however the directions and terminology is vague so it takes a while to setup. From a functional standpoint zoho CRM is feature rich, with endless options for integrations and usages. Cons: The help documents are ok at best, with that being said they do have free email support. The settings and terminology ate difficult to arrange and set per organizational needs. Some if the integrations zoho offers are not two way integrations with their own platforms. Pros: Cheaper than Salesforce and it seems like they offer a lot more add-ons for free so that they can take more market-share from them. For those of us who had used Salesforce, it was pretty easy to use (but not as easy as Salesforce) and we adapted to it just fine. Our younger employees do fine with it, but the older ones struggle (but I blame the people not the software). A decent amount of other software we use integrate with Zoho or are working on that integration. Cons: Boarder-line too many features and add-on programs. Sometimes accidentally navigate to different app (outside of the CRM) and it can be confusing. So I'd save navigation could use some work. Some areas feel half-baked, like the functionality is mostly there but the UI/UX isn't quite fleshed out perfectly. Overall: It does what you need a CRM to do- that's to keep your customers, prospects, and opportunities organized in one location. And it does it for a more reasonable price compared to the Salesforce standard. Great improvement over standard contact management software. Pros: There is so much flexibility and customization possible, you are mostly limited by your ability to use them all. It has given our sales managers much better tools to manage their leads and accounts, and given management visibility to everything that is happening. It ensures that potential customers aren't left hanging and that the whole team knows the history of interactions. The ability to customize all of the modules and how they interact is great. There are so many features that we are barely using half of them, each month we discover something new that will help us. Cons: It can be a bit confusing to the end users at first, the interface is less intuitive than it could be, especially with all of the different view options. Reports are also a little difficult to build properly. Pros: There are so many customizable options available with Zoho. You can really make the module work the way you want them to. You have to be careful with this, b/c sometime you can go to far and make the system too difficult to use by being too specific. But it's such a powerful tool when you tailor it to your business. Cons: There is a learning curve to the user interface. It does not make a whole lot of sense at first, where things live and how to pull reports and how to customize fields and modules. But once you start to learn the system and understand the layout, it becomes more familiar. Overall: This is the CRM we suggest to most of our small business clients. There's a lot of power, a lot you can customize, and a lot of programs that you can connect to Zoho CRM. It's definitely the best value for people looking for an alternative to SaleForce. Overall: So far I have been using the new CRM for the last 3 months or so and it has been a far improved experience as compared to their previous iteration of the CRM software. Of the best improvements are the additional functionality especially with the new filter features and integration of email into the system, including notifications of opens, clicks etc. There are still some features missing like the full email integration which at the moment is only available to premium customers but hopefully the full suite of services will be available to all in the future. A great system and would recommend to all that want to improve their business processes in dealing with clients, campaigns, marketing and support. -takes a bit of learning but support is there to make it easier. Pros: CRM is broken down into many different categories. Each one combines your Accounts, Activities, Contacts, and many other features. These headers are also broken down in subcategories, which helps group all your important company information together. Its easy to manage everything if you're already using Zoho for your help desk or password system. Zoho is a nice package if you're just starting out with your CRM and you don't want to be confused by having a ton of features all in front of you. Cons: If you plan on switching to another help desk, you'll probably switch your CRM along with it. Zoho combines all your basic needs into one package, but they come up a little short when competing on the market. Connectwise and Atera may come off as having more features that make sense versus having one CRM with only basic information. A lot of these other CRM will group everything together versus going to one particular spot all the time. Pros: * Light on pocket for most small and mid scale companies when compared to other expensive CRM alternatives. * Can customize the software as per the company needs. Adding custom fields, layouts is an easy task and can be done by an end user itself. * Forecasting feature which can be helpful to forecast the future sales. * Process automation can be performed easily via workflows. * Card scanner feature to scan the business card and automatically create contacts/leads from it. * Facebook style feeds which helps to glance through the team updates and wins. Cons: * It takes a while to adjust to the UI since it has many options/features available. * We might have to rely on other third party tool/add-on to send mass mailers (For notifications,newsletters etc) as the mail designer/mass mail feature is not powerful enough and lacks tracking of mails sent.